Just finished reading I Am Legend. Looking at the thickness of the book, I thought it was a novel, but in fact it's a short story. 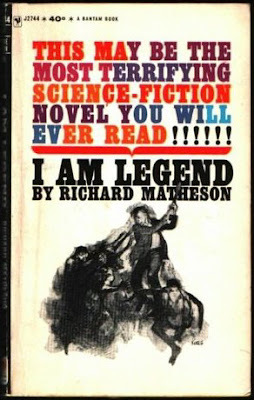 The rest of the book is a compilation of other short stories by the author, Richard Matheson. I didn't know this until I finished reading the I Am Legend portion. Imagine my surprise when less than a quarter through the book, the story suddenly ended! The big difference between the book and movie is not just that the original hero wasn't a black dude, but the book is really actually about vampires! Fear of garlic, crosses, sunlight, the works. The great thing is that the author uses scientific reasoning to explain how vampirism works, and why they feared the abovementioned objects, which at first glance seems a little illogical. The movie used very, very little of these stuff, but concentrated more on the "last man on Earth" concept. Also, I think it's probably the best and ultimate vampire story I've ever heard or read about. It makes Anne Rice look really stupid. As for the ending, well, it's like those Twilight Zone kind of ending. It's not something stupid like I woke from a dream or he goes into the next dimension or something. Though a little shocking (and an ironic joke), it still makes perfect sense that it ended that way. But it's also very sad and depressing. Everybody seemed to like the book's original ending, but it might be too much for regular folks at the cinemas, because they'll be so disappointed at the outcome after all the hard work and sacrifice Robert Neville made.